google rolled out version 2 of their google+ service a few months back, and it seems to have a glitch involving the resizing of animated gifs. the glitch causes black pixels to be misinterpreted as transparent, which results in ghosting artifacts. i've taken to calling this glitch transparent black. naturally, many artists's first reaction to this glitch is that they want to avoid it, but my immediate reaction was that i wanted to learn how to deliberately invoke it. this post will tell you how to do both. here's how the glitch works. google+'s "preview" window is a seemingly arbitrary 497 pixels wide. if you upload a gif that's wider than this, google+ will resize it to 497, showing the resized version in the preview window, and allowing you to click it to view the original, full-sized gif. but if your original has any true black pixels, these will turn transparent in the resized gif. you may have already guessed at a technique for how to avoid this glitch. one is to simply size your gifs to 497 pixels or fewer in width. another is to not use black—or if you want to use black, use a color that looks black but isn't quite #000000.
your gif needs to be wider than 497 pixels. 500 is often big enough, but bigger than that will work. your gif must have "true" black. i don't know if there's a tolerance (if, say, #000001 would be close enough, or even #0F0F0F), but merely "looking black" isn't enough. 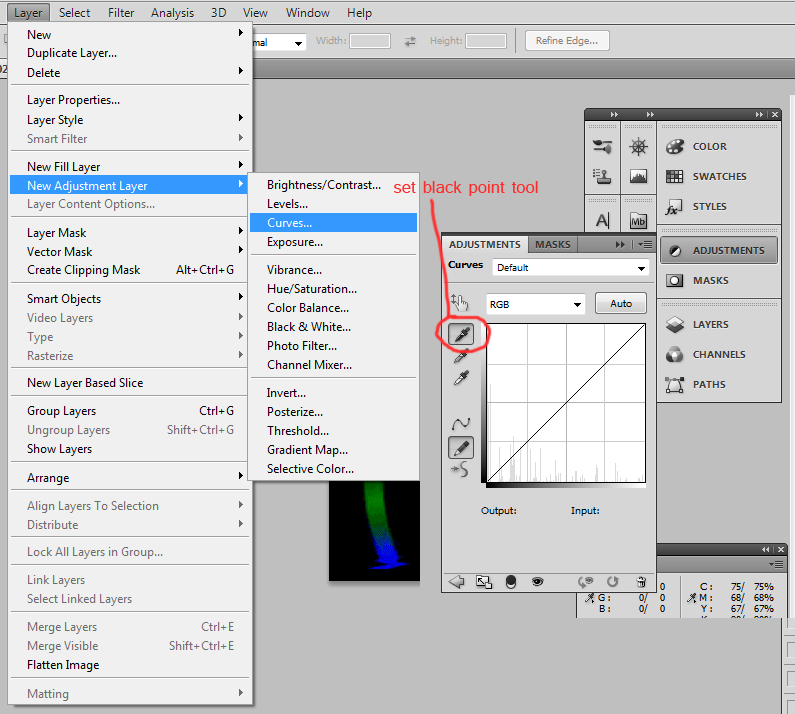 the easiest way to ensure that your gif has true black in photoshop is to add a "curves" adjustment layer at the top of the layer stack, and then use the "set black point" eyedropper. pick a pixel that's "close enough" to black and click it with the black-point dropper. all pixels of that shade or darker will turn to true black. you may also want to set a white point using the white-point eyedropper, but this isn't necessary. that's it! simply upload your gif to google+ and it should come out glitched. you may then save the glitched version using right-click (or whatever the mac equivalent) and post it elsewhere. note that resized version of your gif may actually be larger (in terms of storage space) than the original, so if you want to repost it somewhere with a size cap (like tumblr), you may need to re-encode to shrink the file. i've been using the tag #transparentblack on google+ and #transparent black on tumblr, so if you experiment with this glitch, tag your posts accordingly so that others can find them. and happy glitching!